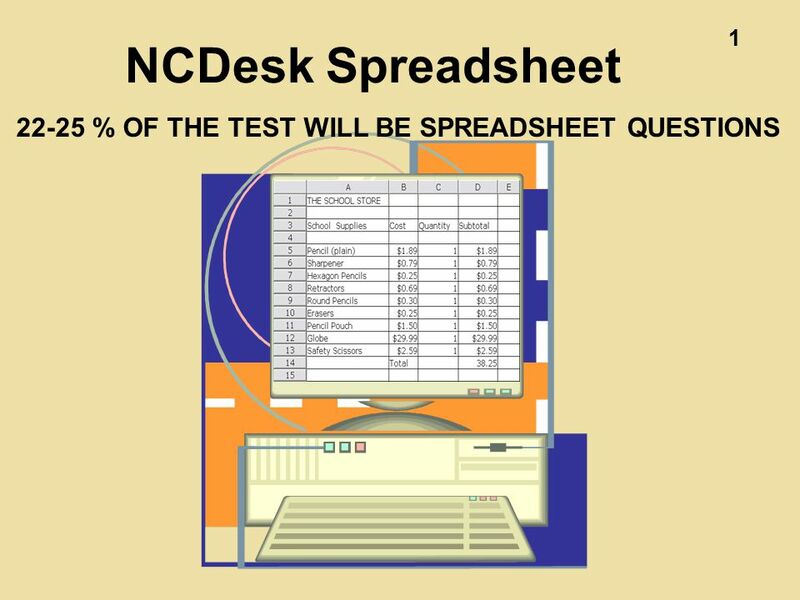 1 NCDesk Spreadsheet 22-25 % OF THE TEST WILL BE SPREADSHEET QUESTIONS. 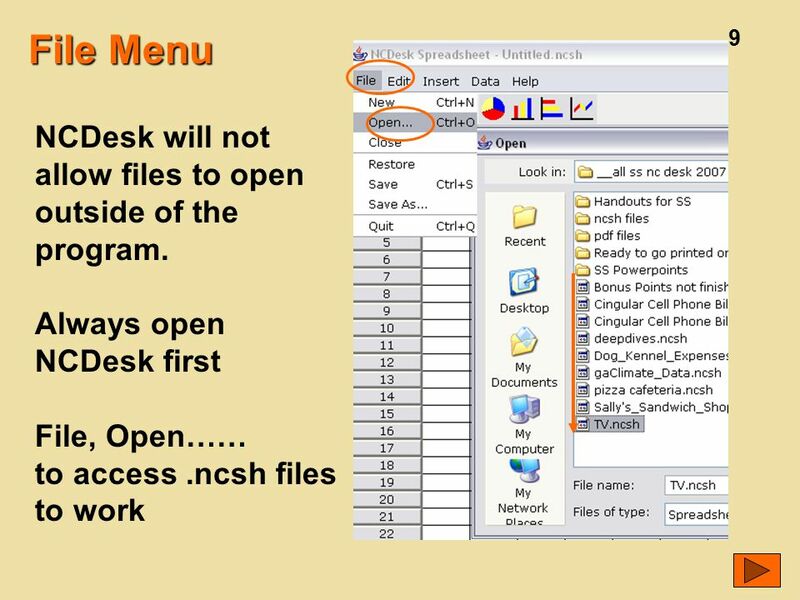 2 2 NCDesk is a collection of small Java programs that replicate common applications. 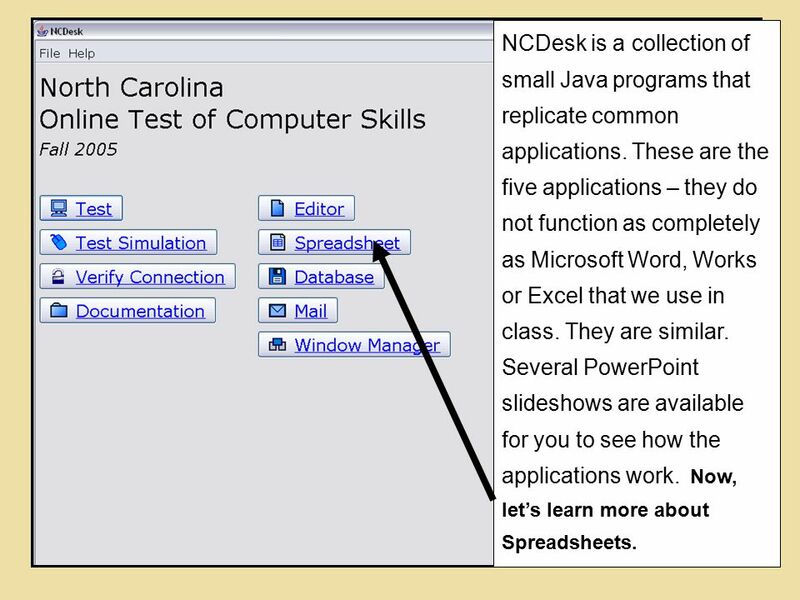 These are the five applications – they do not function as completely as Microsoft Word, Works or Excel that we use in class. They are similar. 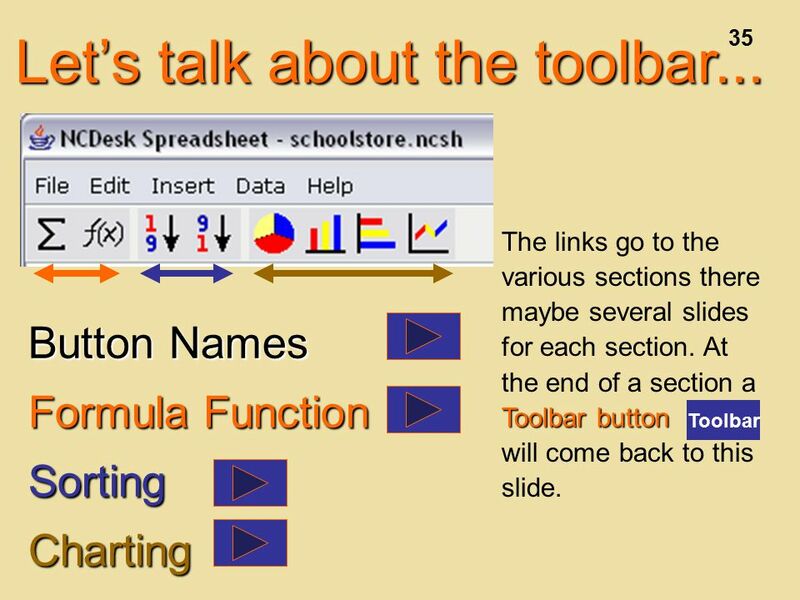 Several PowerPoint slideshows are available for you to see how the applications work. 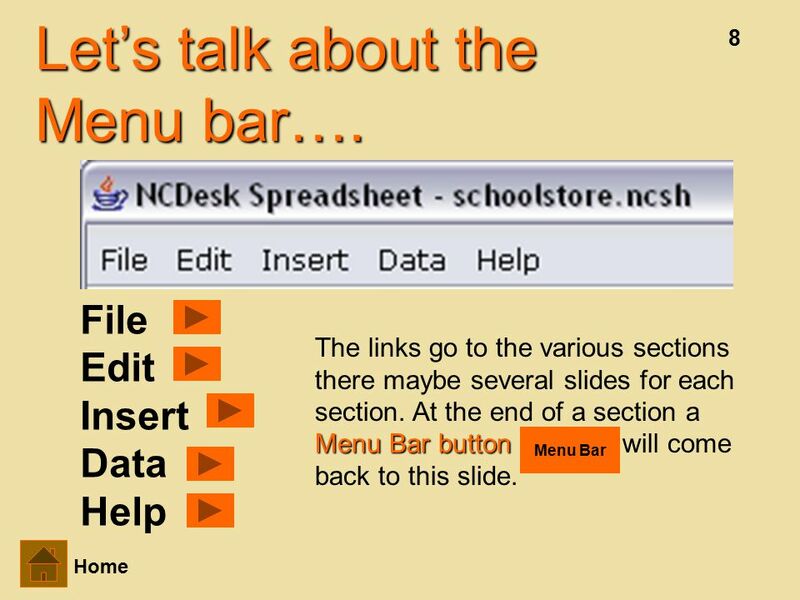 Now, let’s learn more about Spreadsheets. 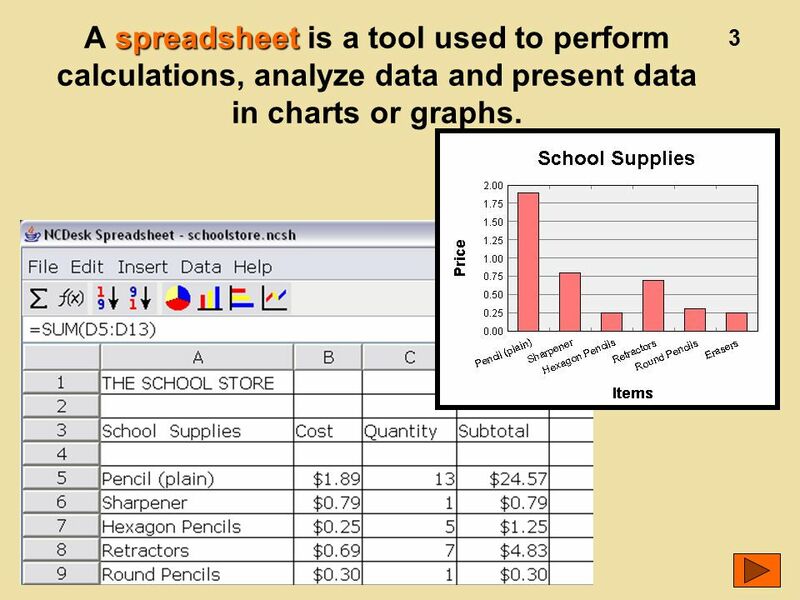 3 3 spreadsheet A spreadsheet is a tool used to perform calculations, analyze data and present data in charts or graphs. 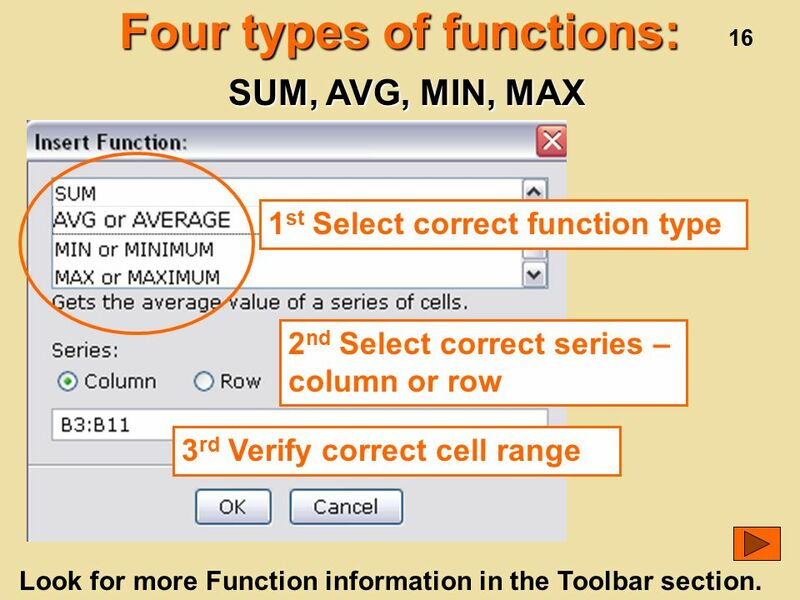 16 16 Four types of functions: 1 st Select correct function type 2 nd Select correct series – column or row 3 rd Verify correct cell range SUM, AVG, MIN, MAX Look for more Function information in the Toolbar section. 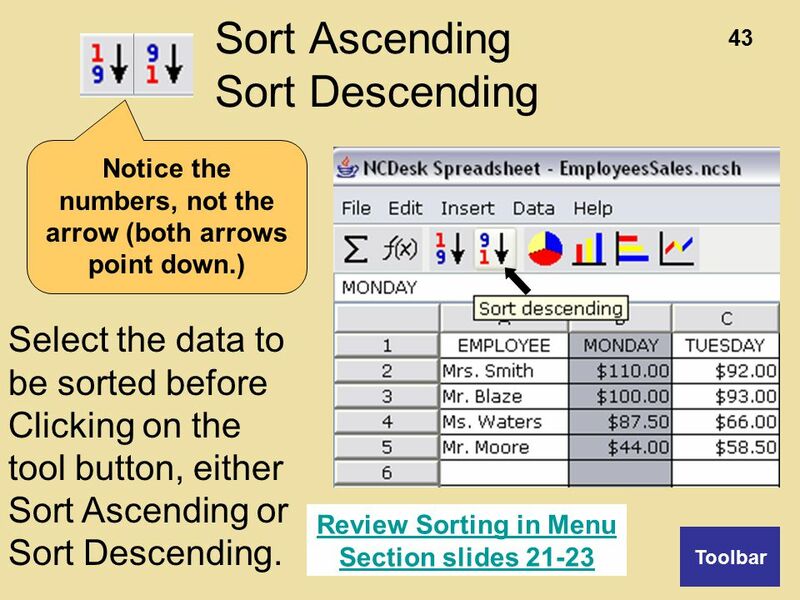 22 22 Data >Sort  method of sorting data in Reverse alphabetical order (Z-A) or reverse numerical is high to low (9-0). 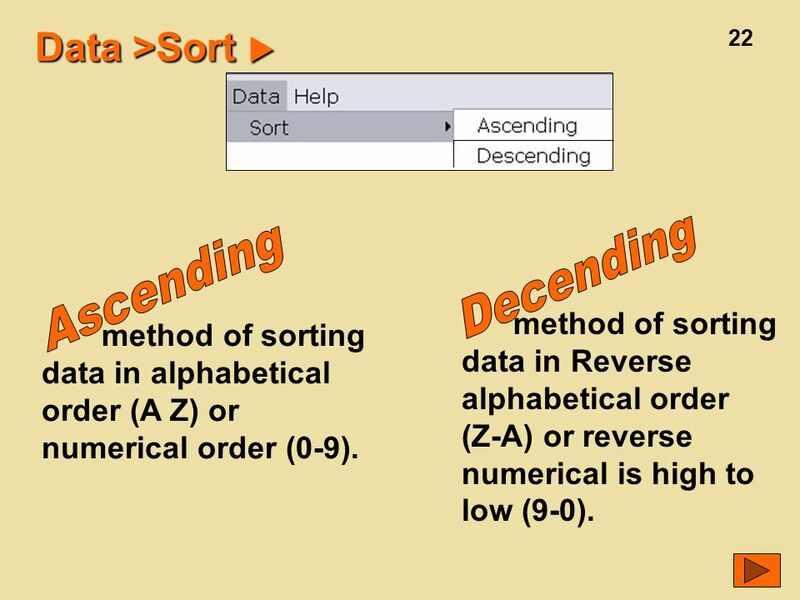 method of sorting data in alphabetical order (A Z) or numerical order (0-9). 23 23 Read your error messages. 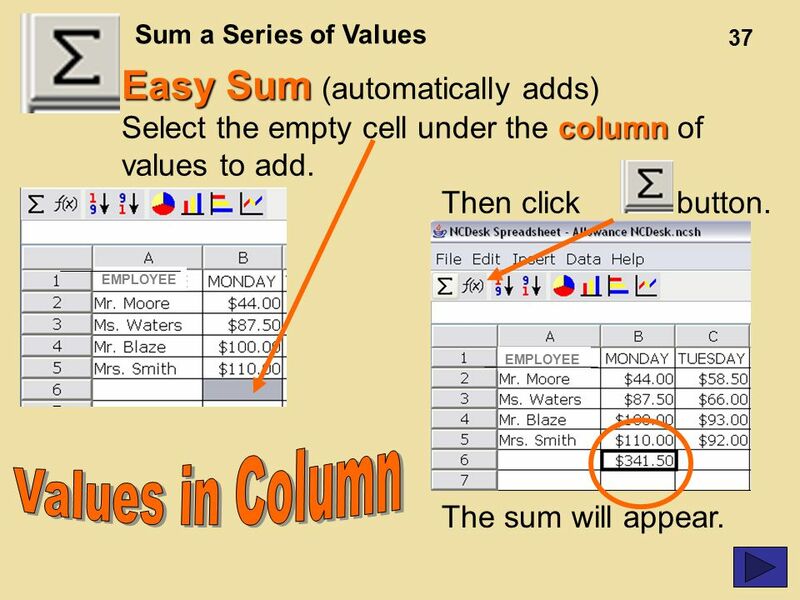 Attempting to sort a column in a spreadsheet can interfere with formulas that are part the information being sorted. 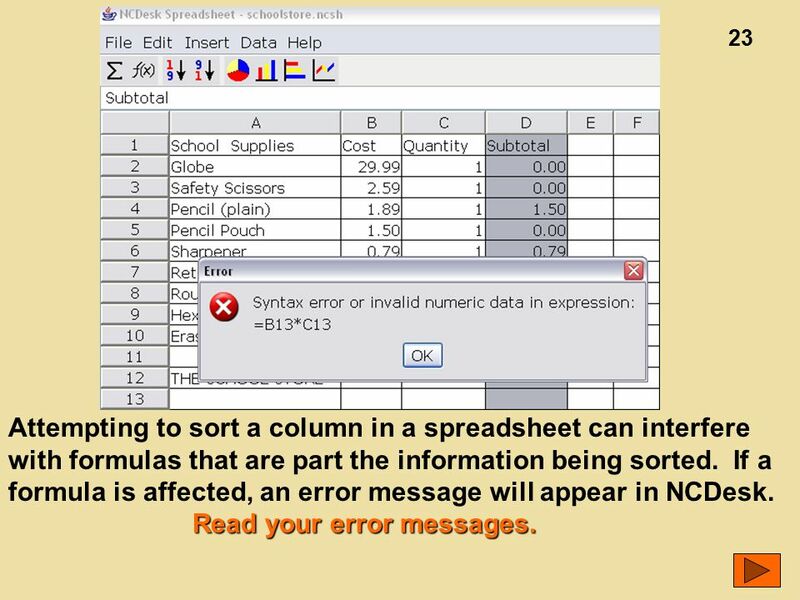 If a formula is affected, an error message will appear in NCDesk. Read your error messages. 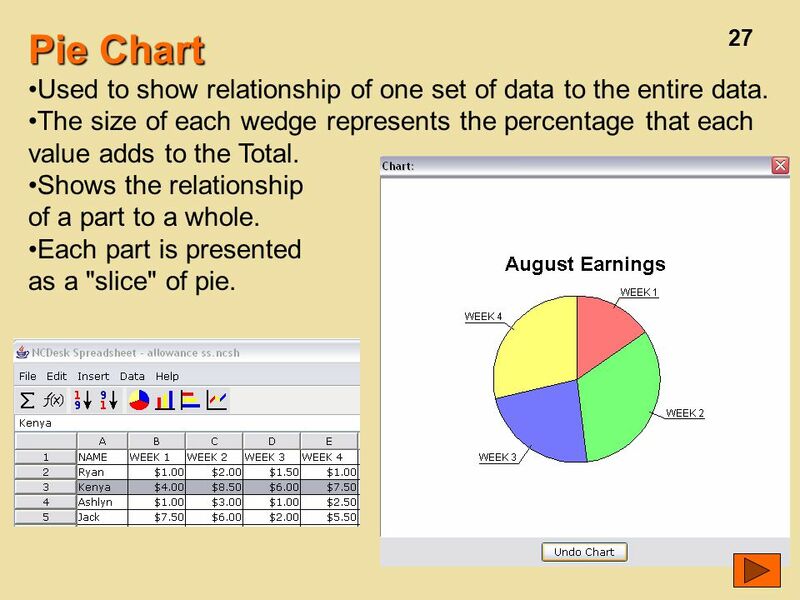 27 27 Pie Chart Used to show relationship of one set of data to the entire data. The size of each wedge represents the percentage that each value adds to the Total. Shows the relationship of a part to a whole. Each part is presented as a "slice" of pie. 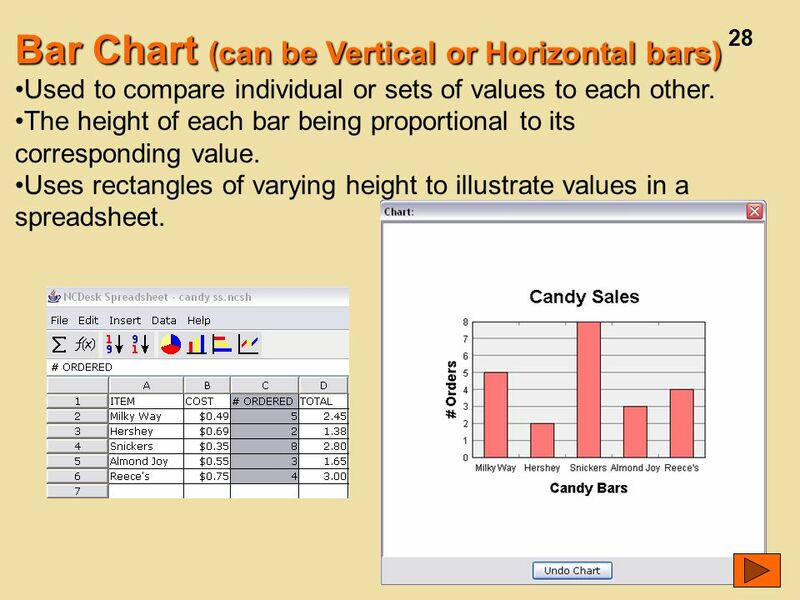 28 28 Bar Chart (can be Vertical or Horizontal bars) Used to compare individual or sets of values to each other. The height of each bar being proportional to its corresponding value. Uses rectangles of varying height to illustrate values in a spreadsheet. 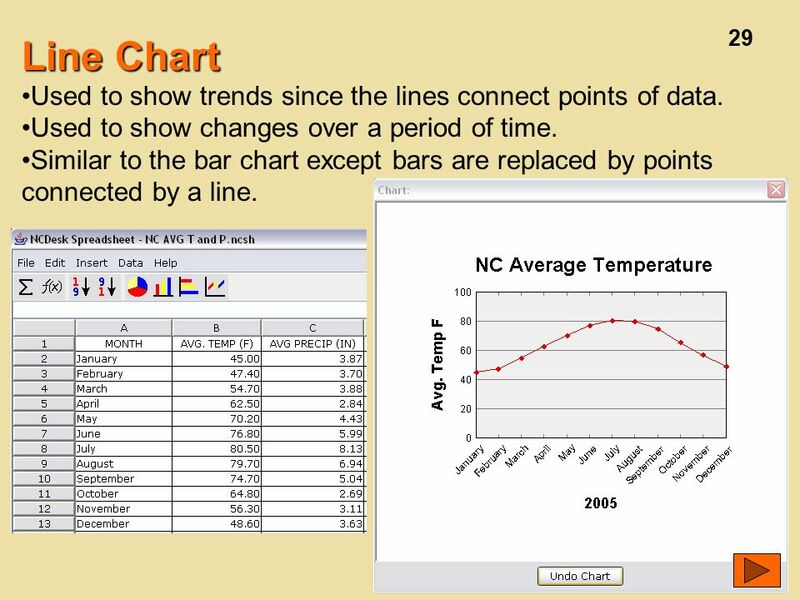 29 29 Line Chart Used to show trends since the lines connect points of data. Used to show changes over a period of time. 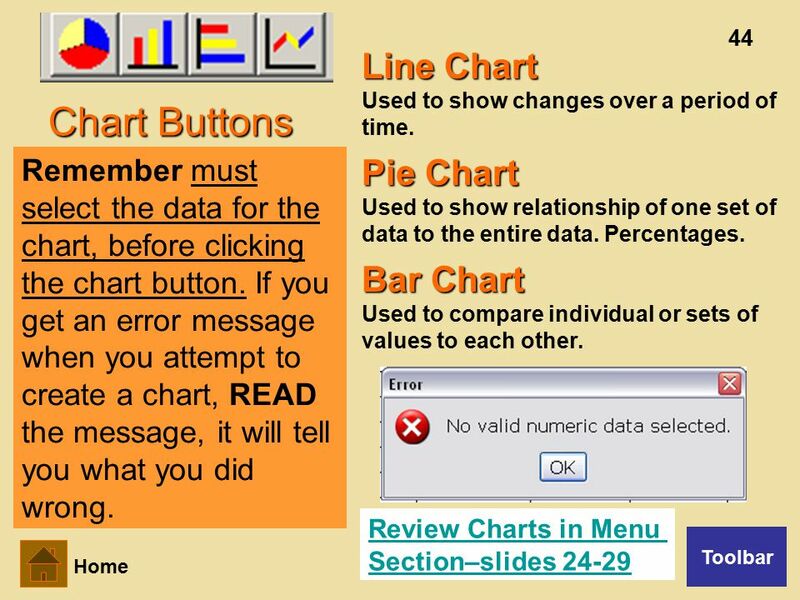 Similar to the bar chart except bars are replaced by points connected by a line. 34 34 Menu Bar Home even during the test. 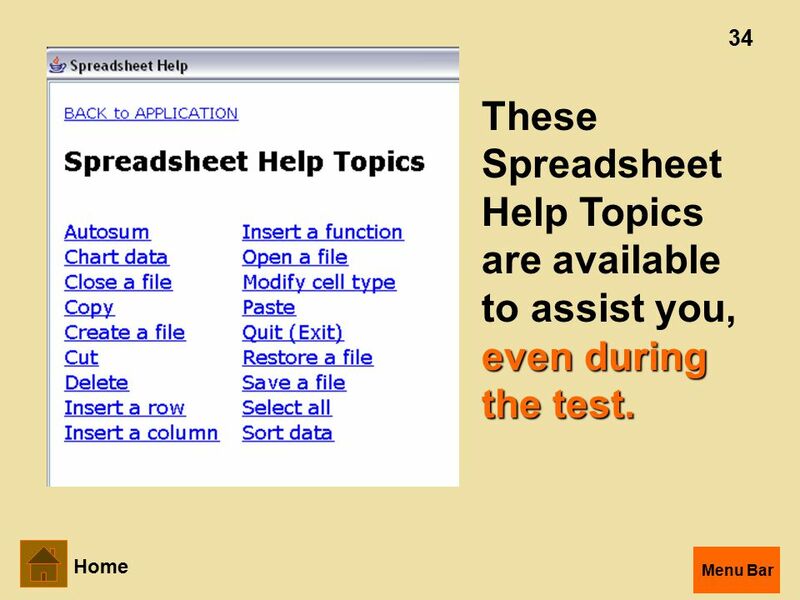 These Spreadsheet Help Topics are available to assist you, even during the test. 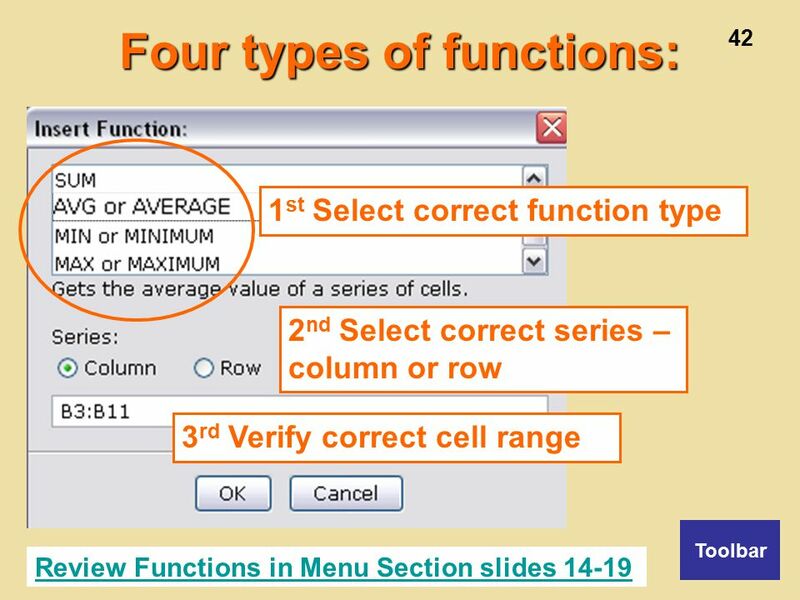 41 41 Function Function – This button begins the process to insert a function formula in a cell. 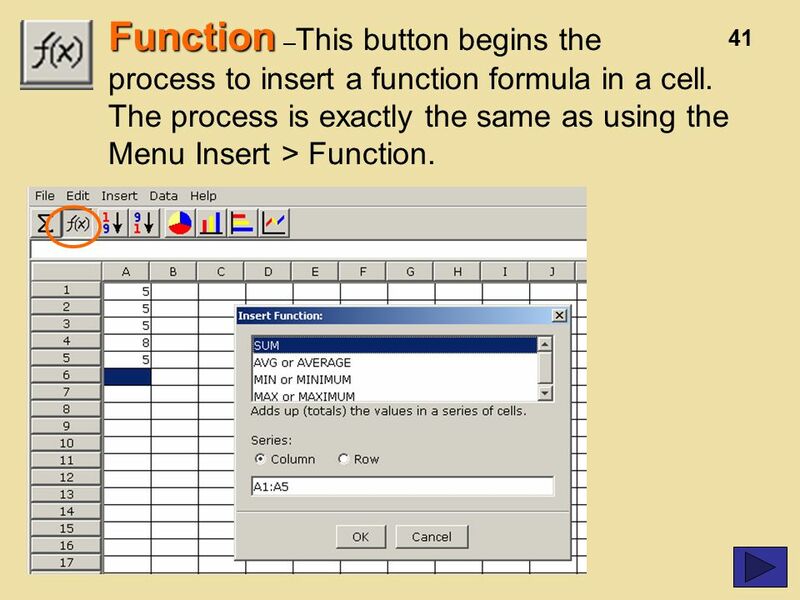 The process is exactly the same as using the Menu Insert > Function. 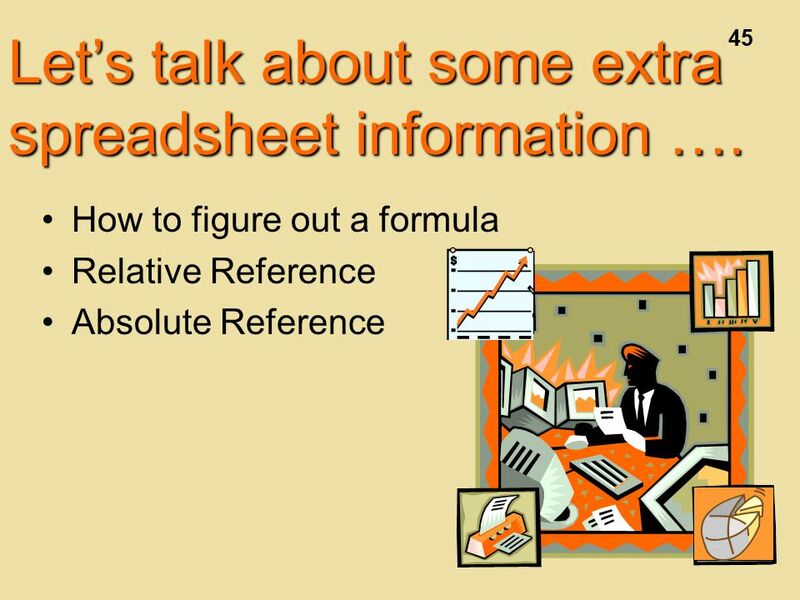 45 45 How to figure out a formula Relative Reference Absolute Reference Let’s talk about some extra spreadsheet information …. 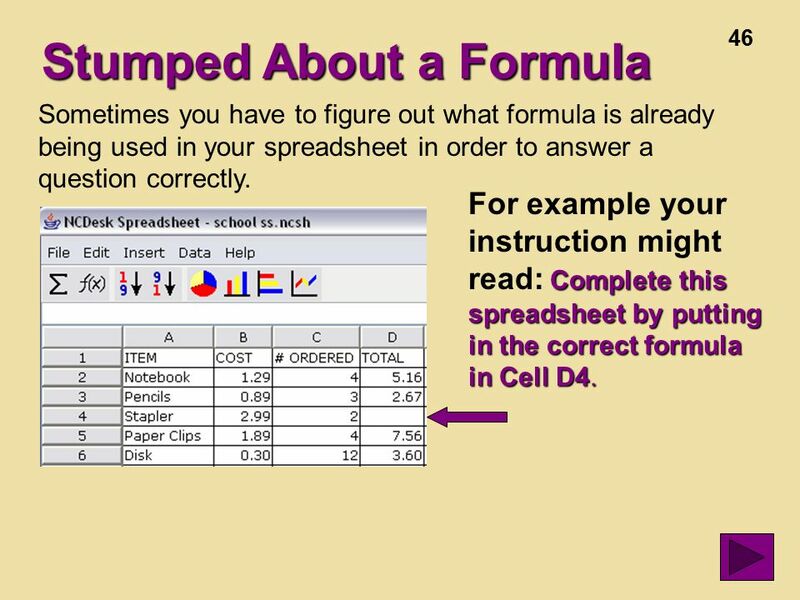 46 46 Sometimes you have to figure out what formula is already being used in your spreadsheet in order to answer a question correctly. 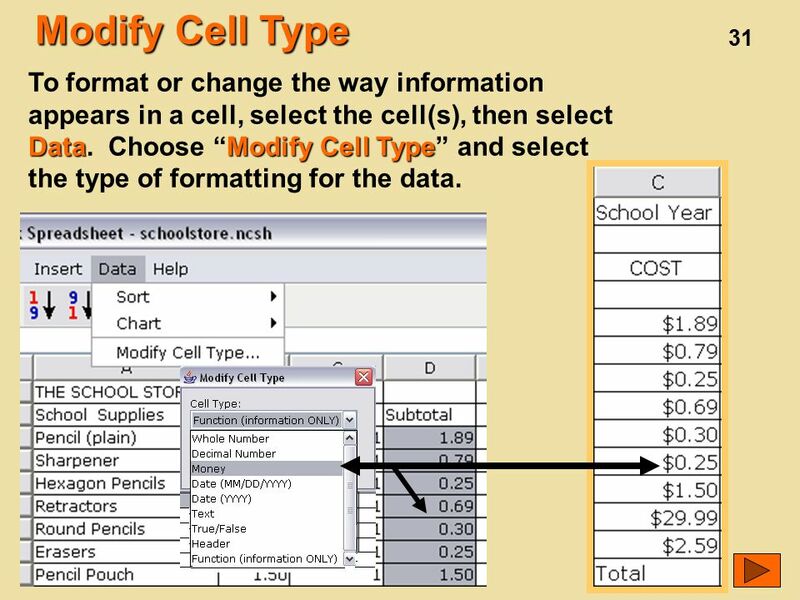 Stumped About a Formula Complete this spreadsheet by putting in the correct formula in Cell D4. 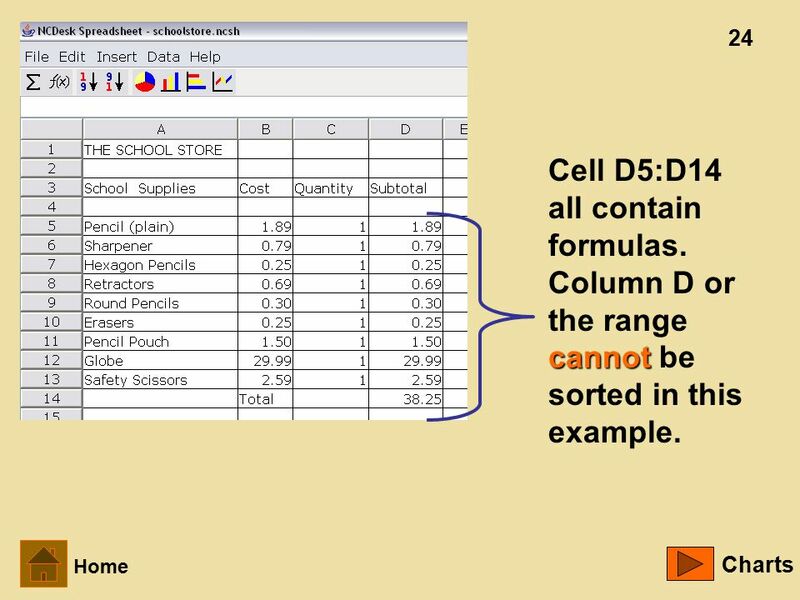 For example your instruction might read: Complete this spreadsheet by putting in the correct formula in Cell D4. 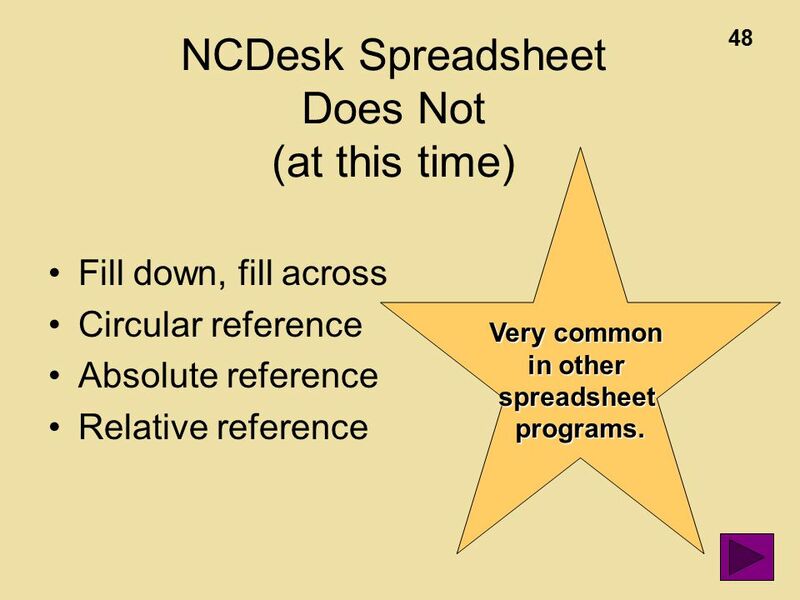 48 48 NCDesk Spreadsheet Does Not (at this time) Fill down, fill across Circular reference Absolute reference Relative reference Very common in other spreadsheetprograms. 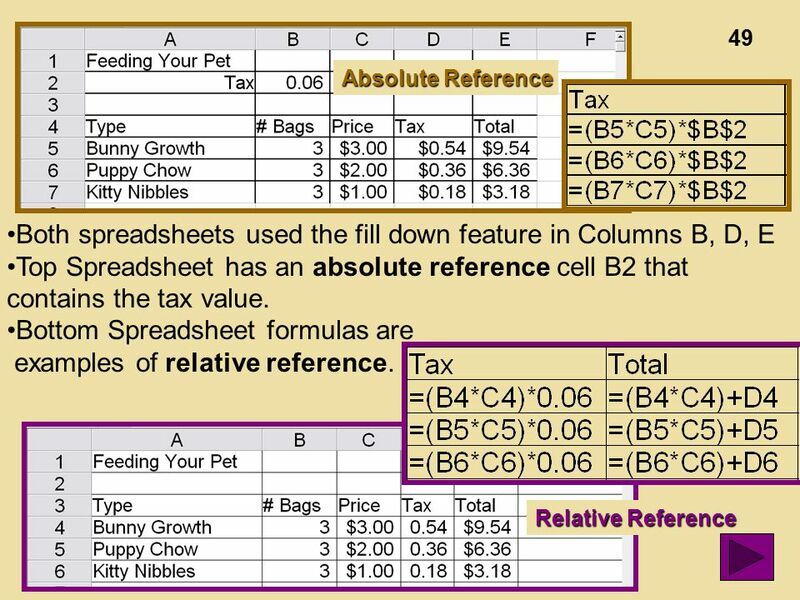 49 49 Absolute Reference Relative Reference Both spreadsheets used the fill down feature in Columns B, D, E Top Spreadsheet has an absolute reference cell B2 that contains the tax value. 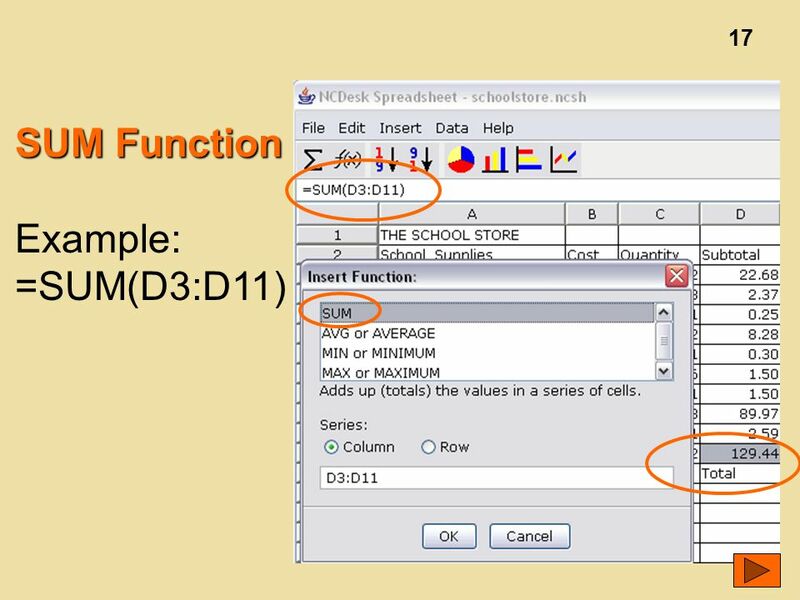 Bottom Spreadsheet formulas are examples of relative reference. 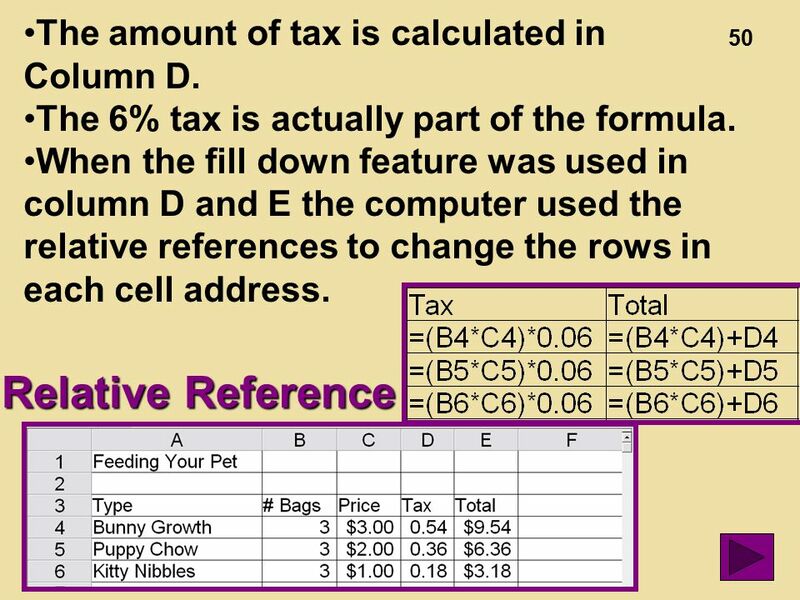 50 50 Relative Reference The amount of tax is calculated in Column D. The 6% tax is actually part of the formula. 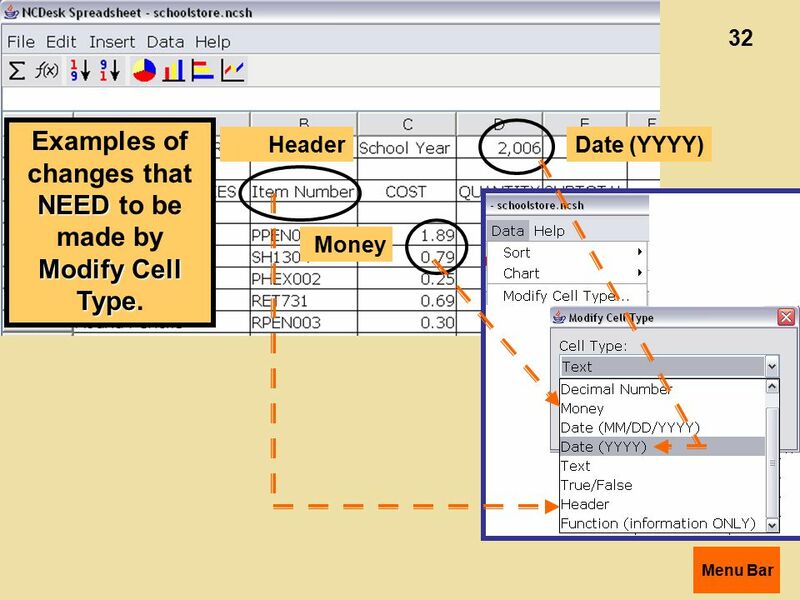 When the fill down feature was used in column D and E the computer used the relative references to change the rows in each cell address. 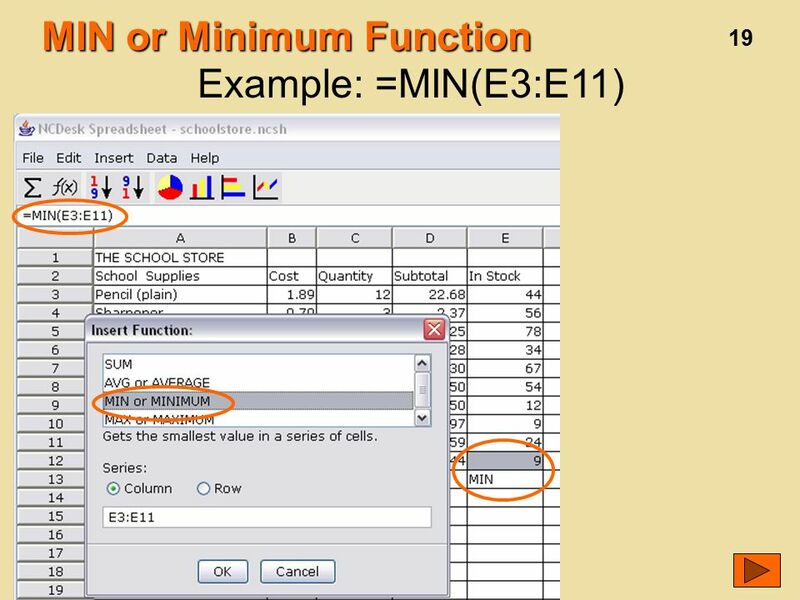 51 51 Absolute Reference These formulas must look to cell B2 for the amount of tax in each calculation. 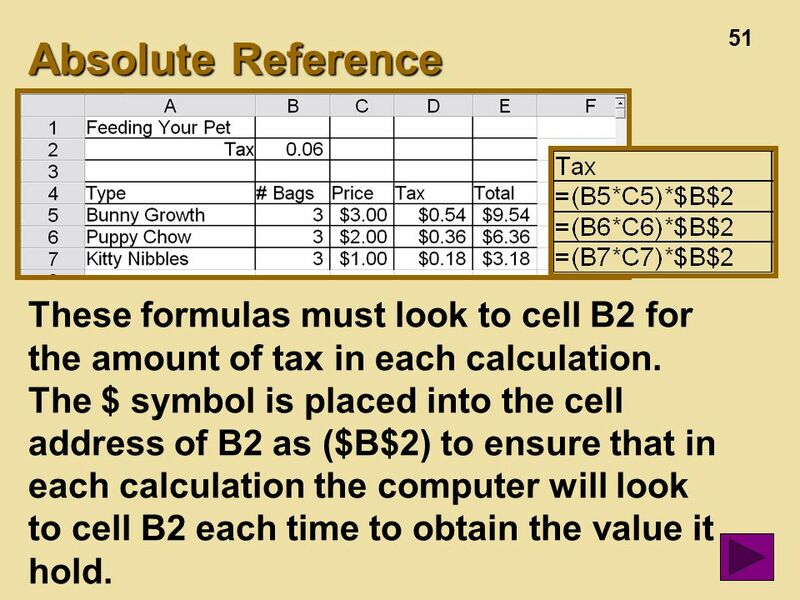 The $ symbol is placed into the cell address of B2 as ($B$2) to ensure that in each calculation the computer will look to cell B2 each time to obtain the value it hold. 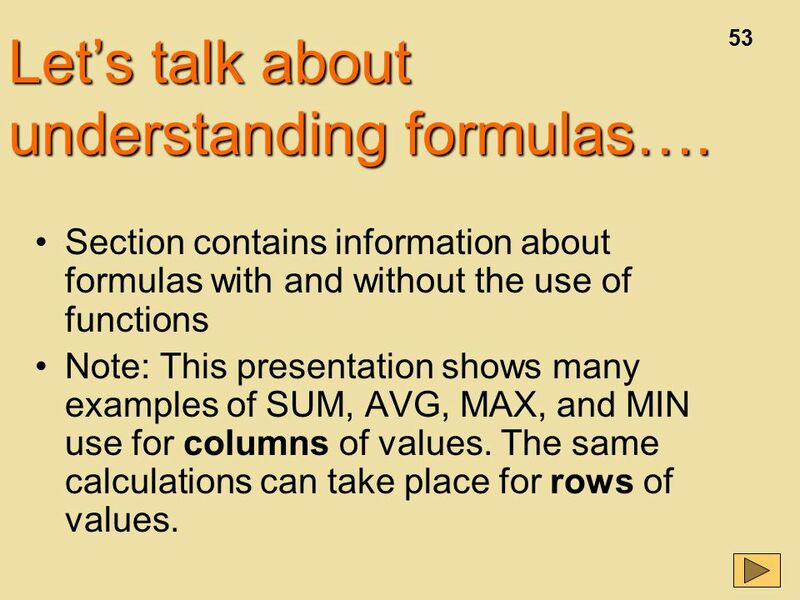 53 53 Section contains information about formulas with and without the use of functions Note: This presentation shows many examples of SUM, AVG, MAX, and MIN use for columns of values. 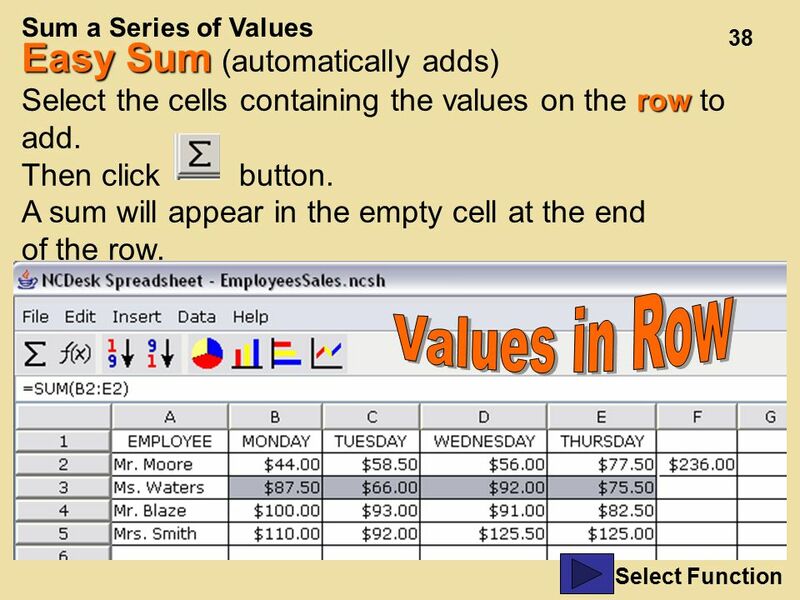 The same calculations can take place for rows of values. 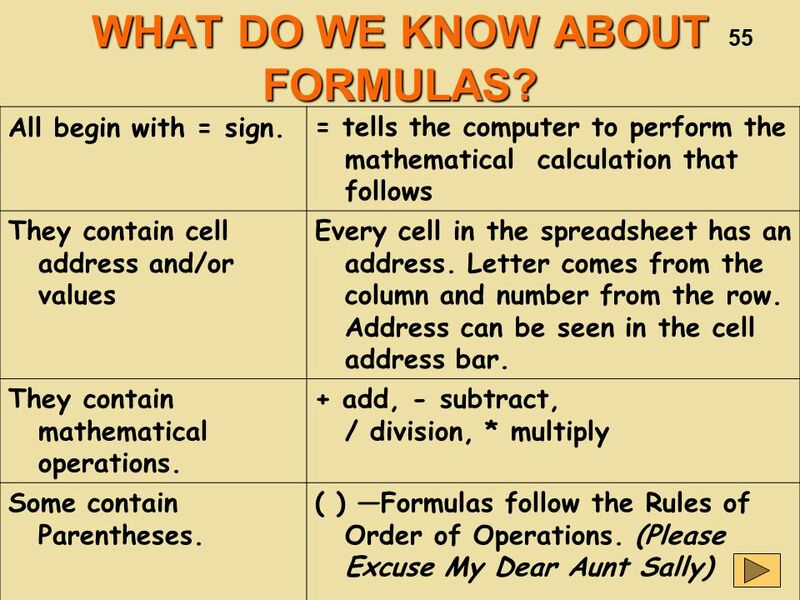 Let’s talk about understanding formulas…. 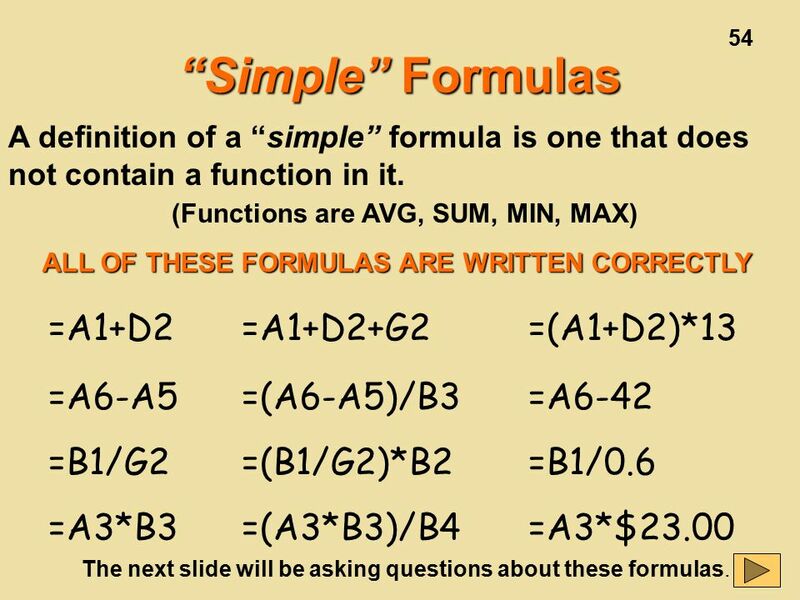 54 54 “Simple” Formulas A definition of a “simple” formula is one that does not contain a function in it. 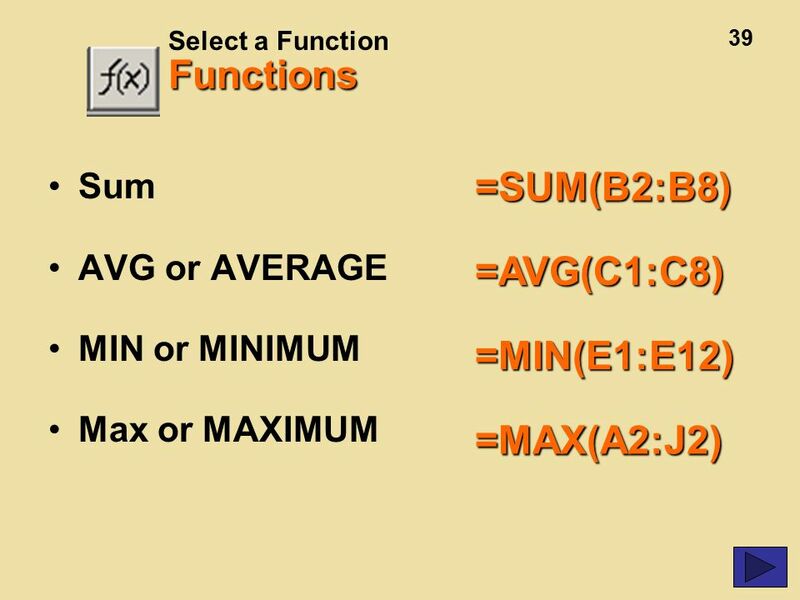 (Functions are AVG, SUM, MIN, MAX) =A1+D2=A1+D2+G2=(A1+D2)*13 =A6-A5=(A6-A5)/B3=A6-42 =B1/G2=(B1/G2)*B2=B1/0.6 =A3*B3=(A3*B3)/B4=A3*$23.00 ALL OF THESE FORMULAS ARE WRITTEN CORRECTLY The next slide will be asking questions about these formulas. 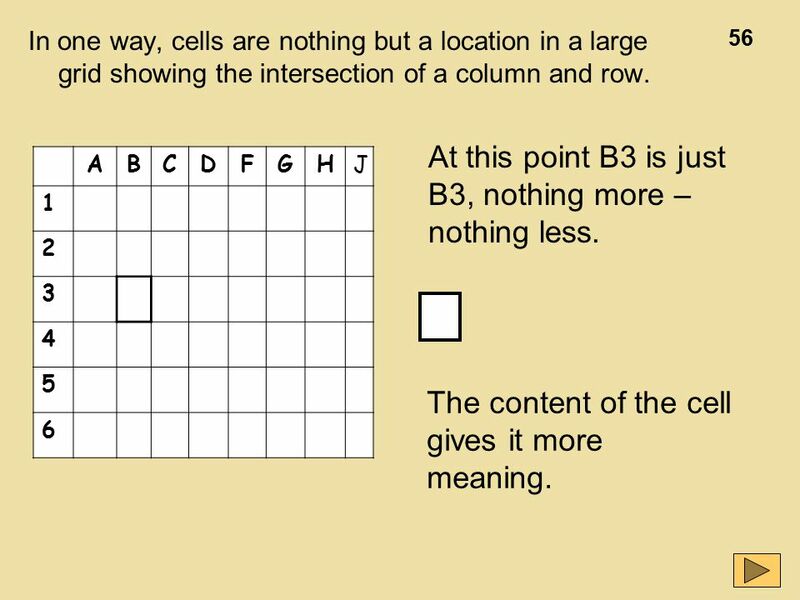 56 56 In one way, cells are nothing but a location in a large grid showing the intersection of a column and row. ABCDFGHJ 1 2 3 4 5 6 At this point B3 is just B3, nothing more – nothing less. The content of the cell gives it more meaning. 57 57 ABCD 1CookiesQuantityPrice Amount Due 2 Vanilla Cream.00 3 Peanut Butter 7.00 4Chocolate.00 5Lemon.00 6Total.00 B3 contains the value 7, but what does 7 mean? 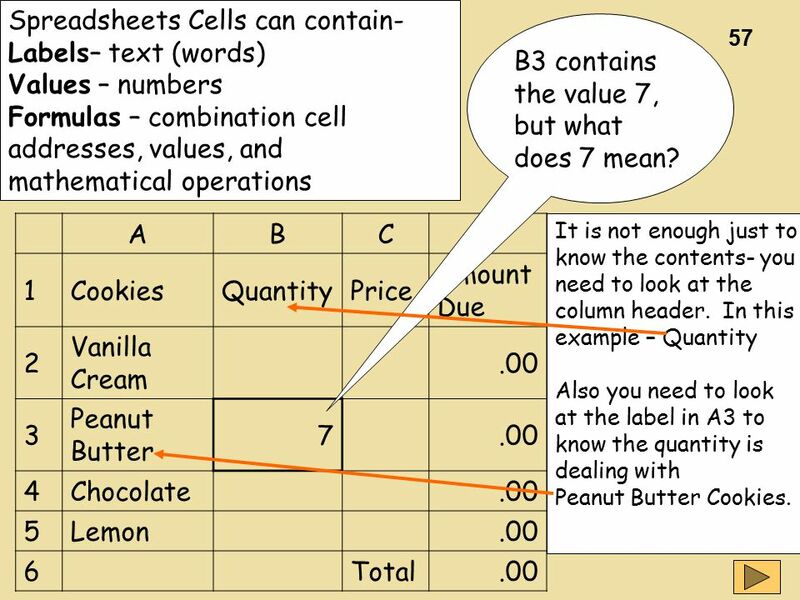 B3 shows Quantity of 7 Peanut Butter Cookies Spreadsheets Cells can contain- Labels– text (words) Values – numbers Formulas – combination cell addresses, values, and mathematical operations It is not enough just to know the contents- you need to look at the column header. 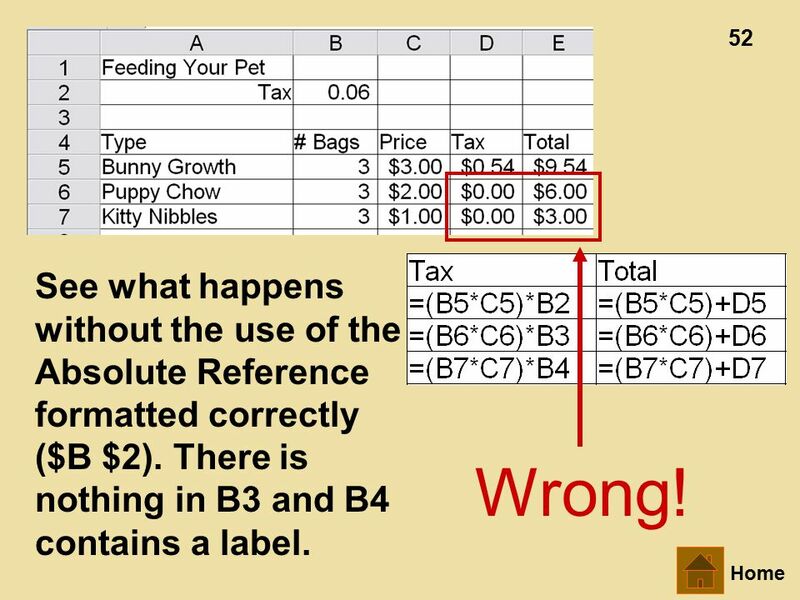 In this example – Quantity Also you need to look at the label in A3 to know the quantity is dealing with Peanut Butter Cookies. 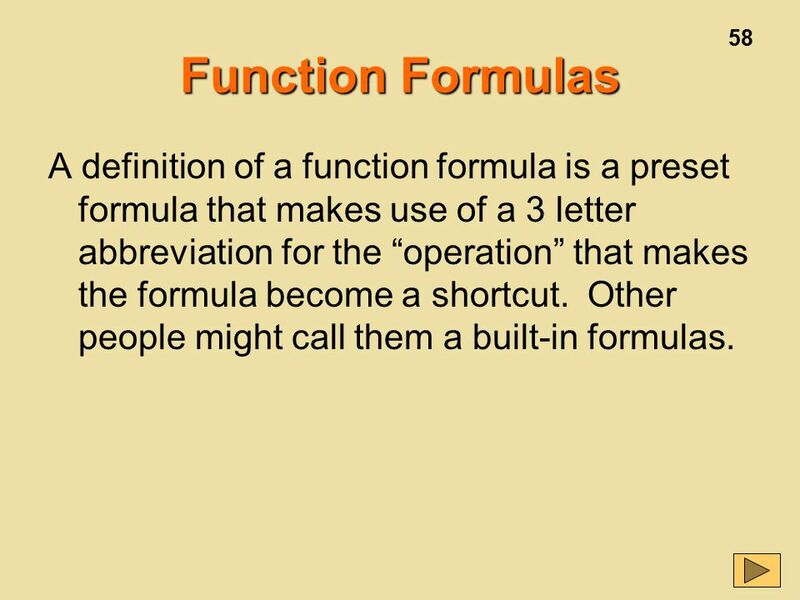 58 58 Function Formulas A definition of a function formula is a preset formula that makes use of a 3 letter abbreviation for the “operation” that makes the formula become a shortcut. Other people might call them a built-in formulas. 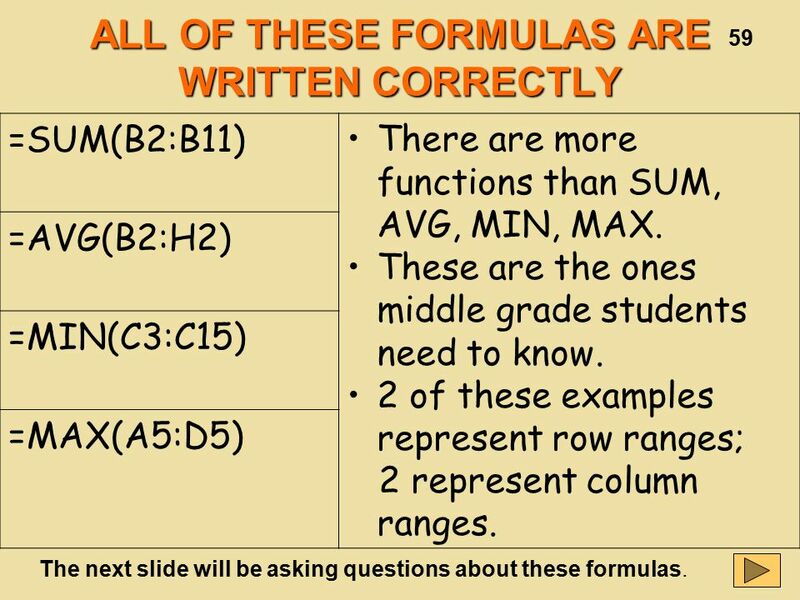 59 59 ALL OF THESE FORMULAS ARE WRITTEN CORRECTLY =SUM(B2:B11)There are more functions than SUM, AVG, MIN, MAX. These are the ones middle grade students need to know. 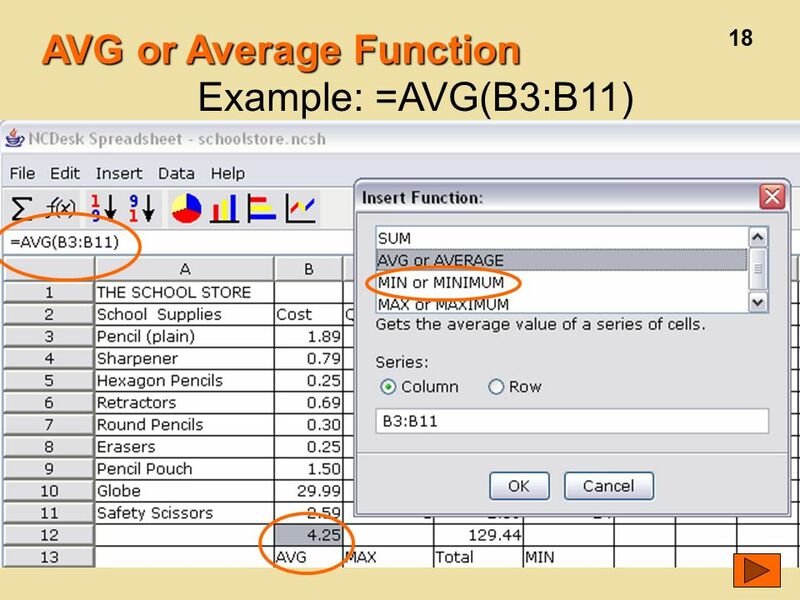 2 of these examples represent row ranges; 2 represent column ranges. 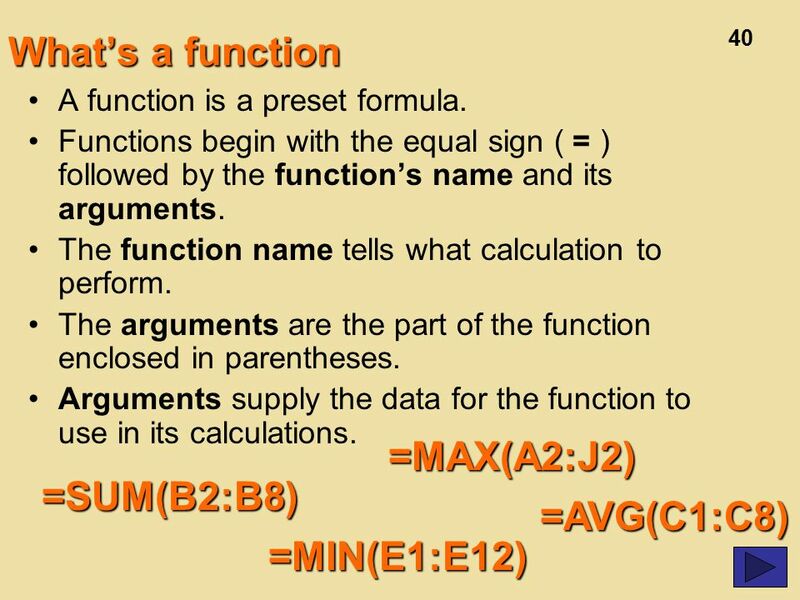 =AVG(B2:H2) =MIN(C3:C15) =MAX(A5:D5) The next slide will be asking questions about these formulas. 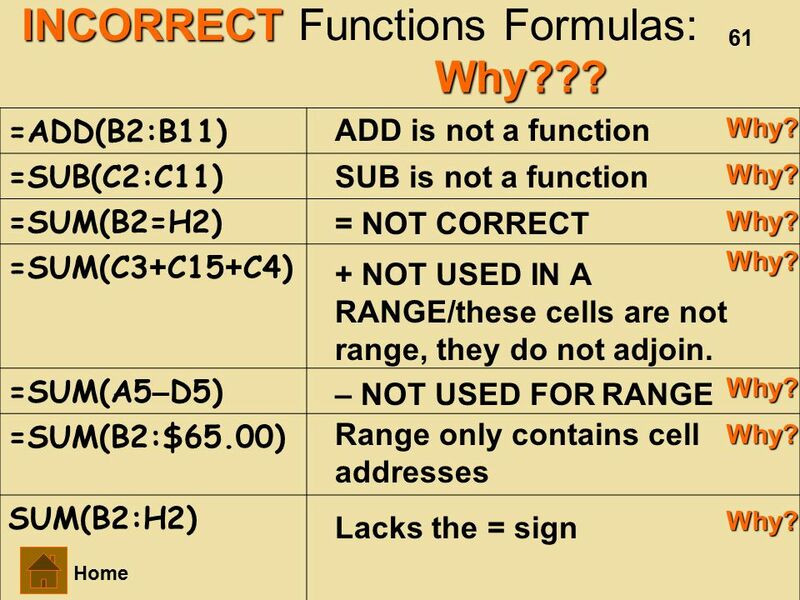 61 61 INCORRECT INCORRECT Functions Formulas: =ADD(B2:B11) =SUB(C2:C11) =SUM(B2=H2) =SUM(C3 + C15 + C4) =SUM(A5 – D5) =SUM(B2:$65.00) SUM(B2:H2) ADD is not a function SUB is not a function = NOT CORRECT + NOT USED IN A RANGE/these cells are not range, they do not adjoin. – NOT USED FOR RANGE Range only contains cell addresses Lacks the = sign Home Why??? Why? Why? Why? Why? Why? Why? Why? 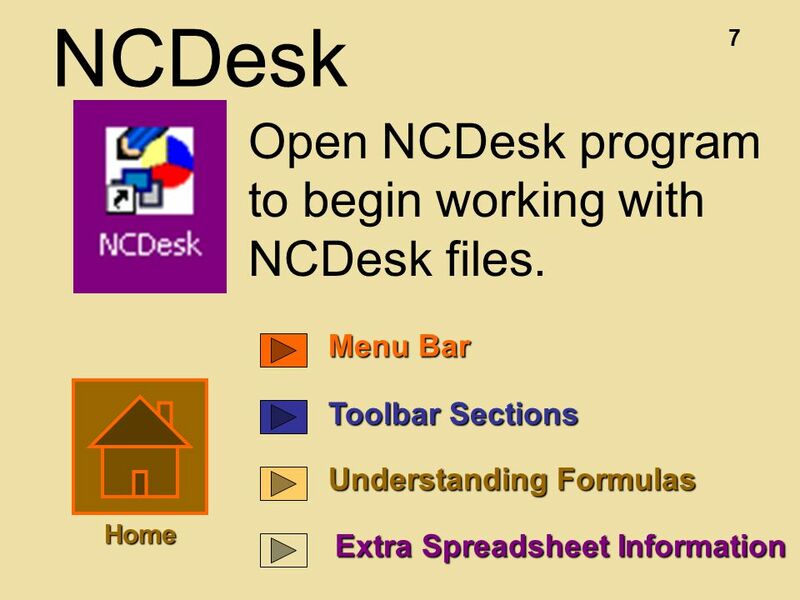 Download ppt "1 NCDesk Spreadsheet 22-25 % OF THE TEST WILL BE SPREADSHEET QUESTIONS." 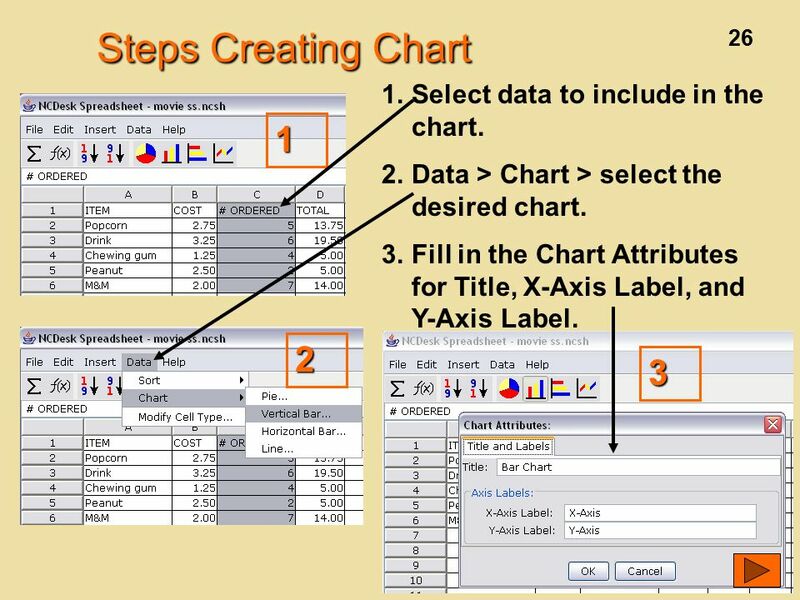 MS EXCEL is a spreadsheet application Excel covers: Calculation Graphic tools Pivot tables Macro programming language called VBA EXCEL is a part of MS. 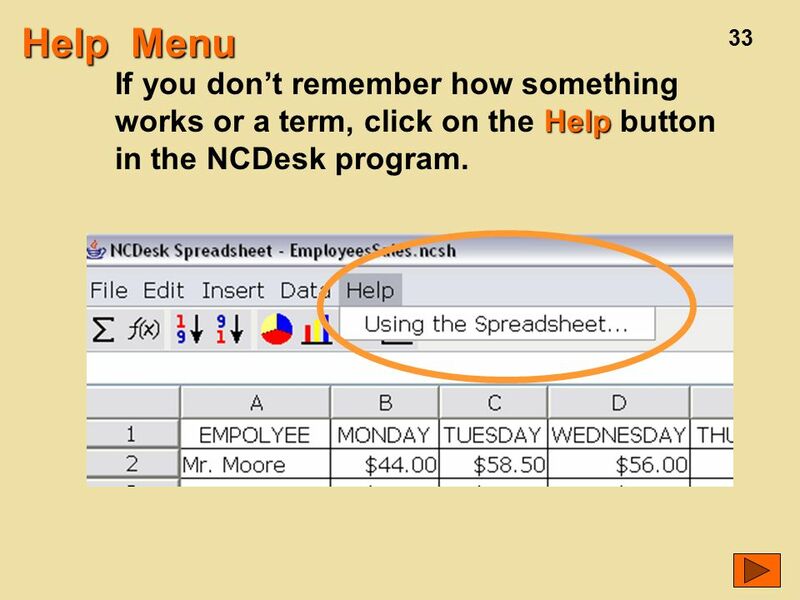 Spreadsheet Software lesson 14. 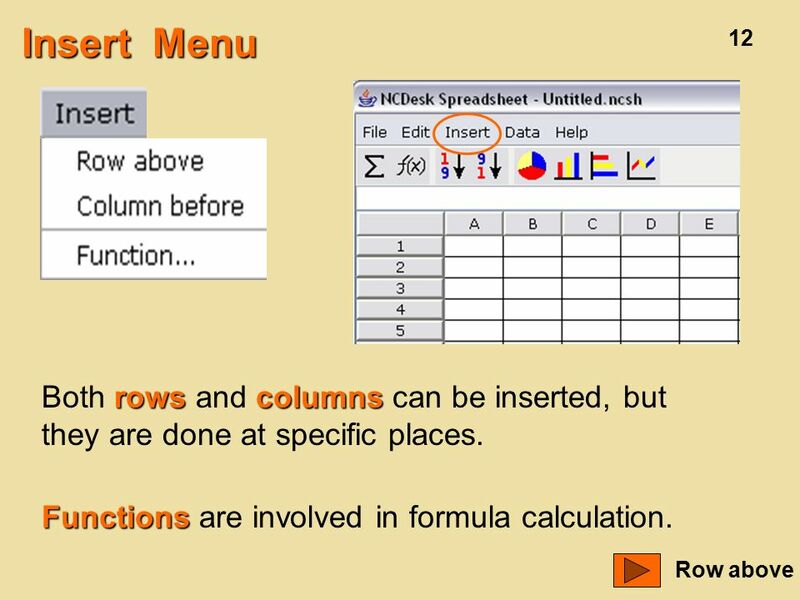 This lesson includes the following sections: Spreadsheet Programs and Their Uses The Spreadsheet's Interface Entering. 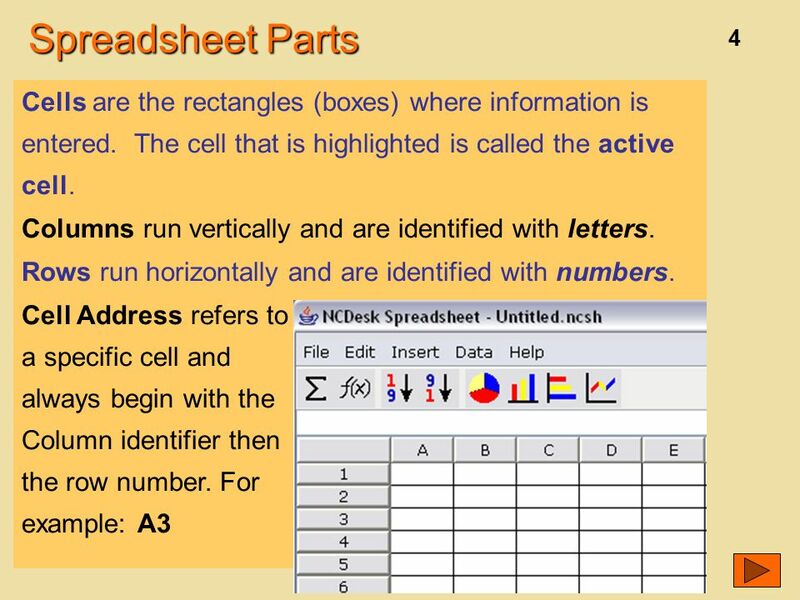 Prepared by : Mahmoud A. Abu Hashish  Used to organize and analyze information  Made up of columns and rows  Columns and rows intersect. 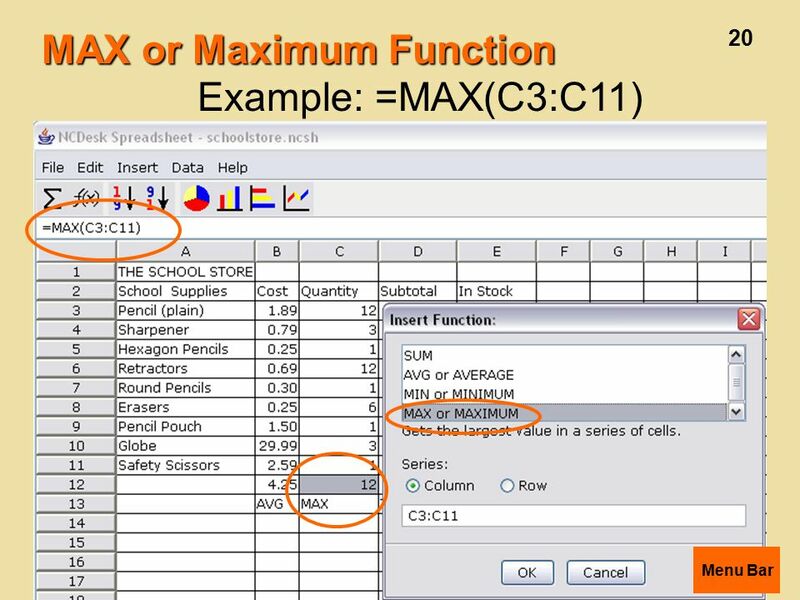 1 Excel Spreadsheets Excel is software that lets you create tables, and calculate and analyze data. 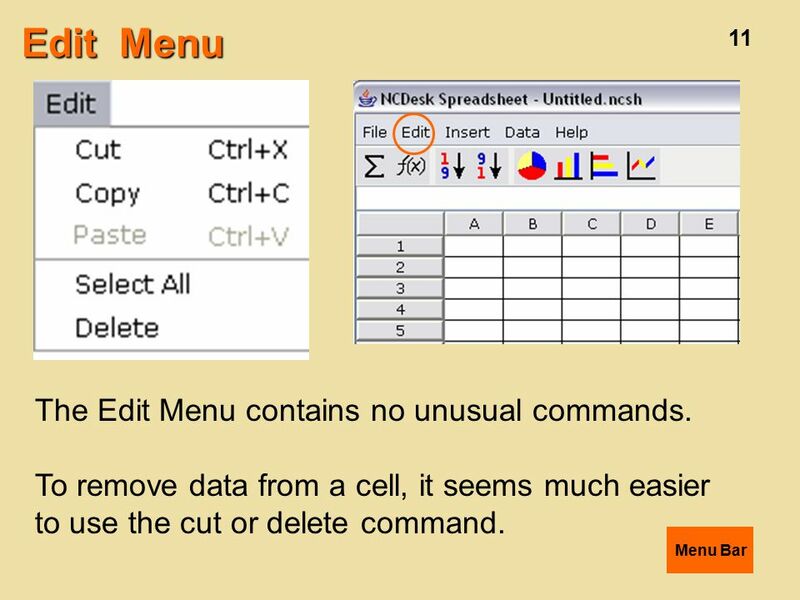 This type of software is called spreadsheet software. 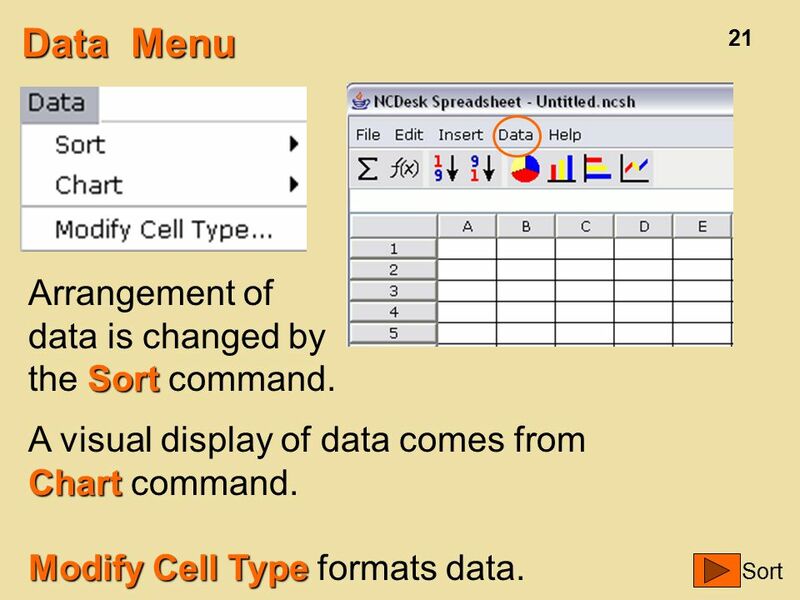  Microsoft Excel is an electronic spreadsheet. 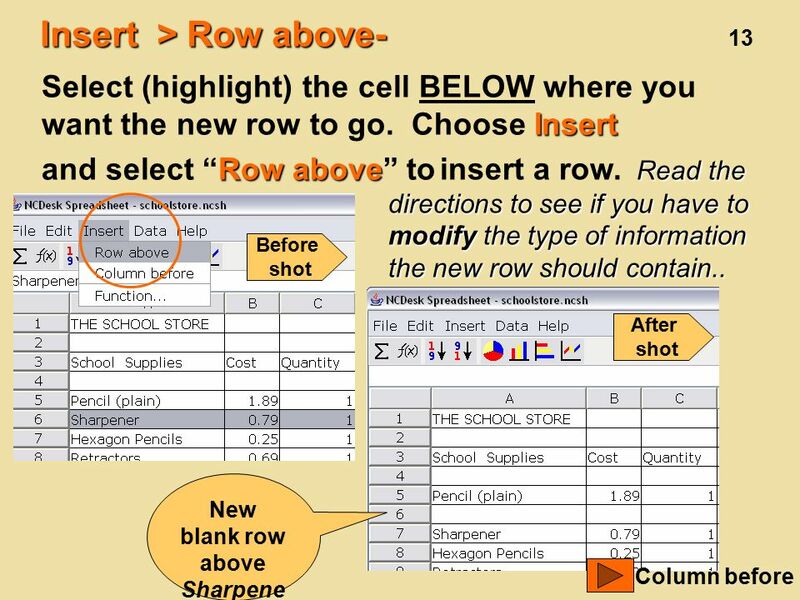  As with a paper spreadsheet, you can use Excel to organize your data into rows and columns and to perform. 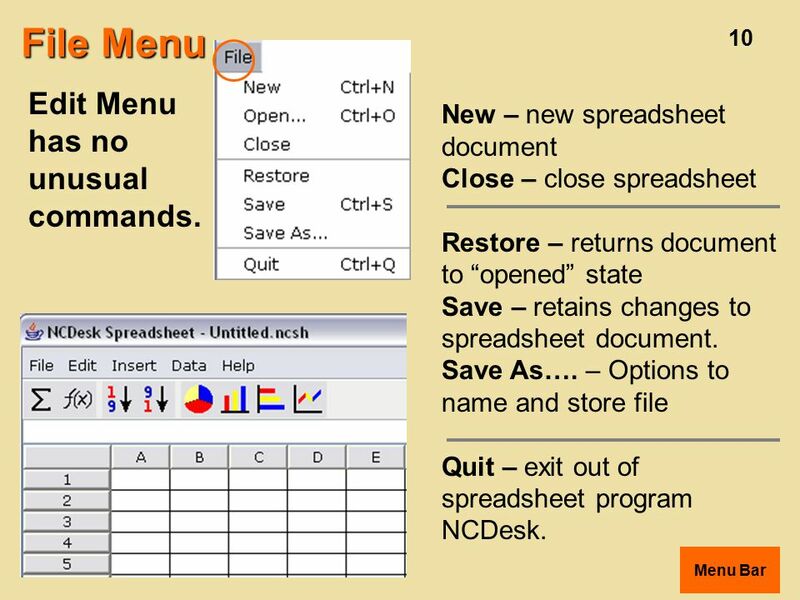 Spreadsheets A spreadsheet package is a general purpose computer package that is designed to perform calculations. 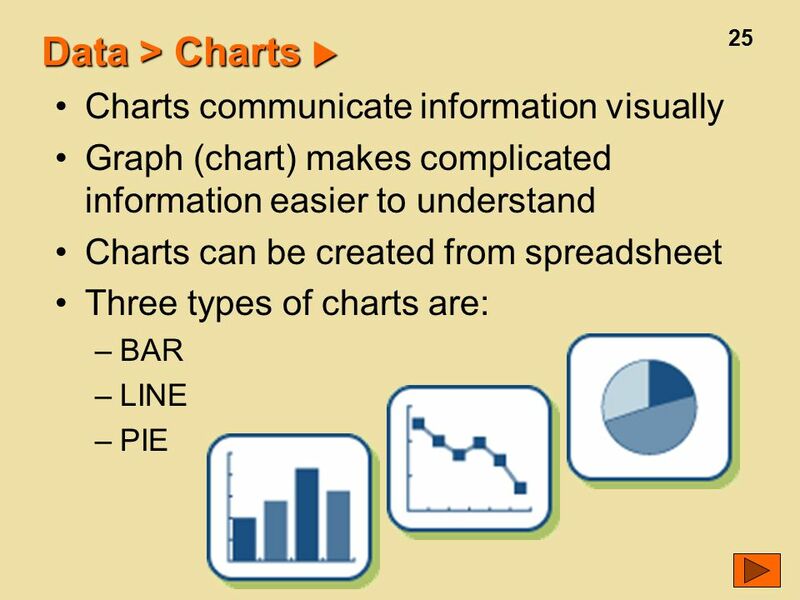 A spreadsheet is a table which is divided. 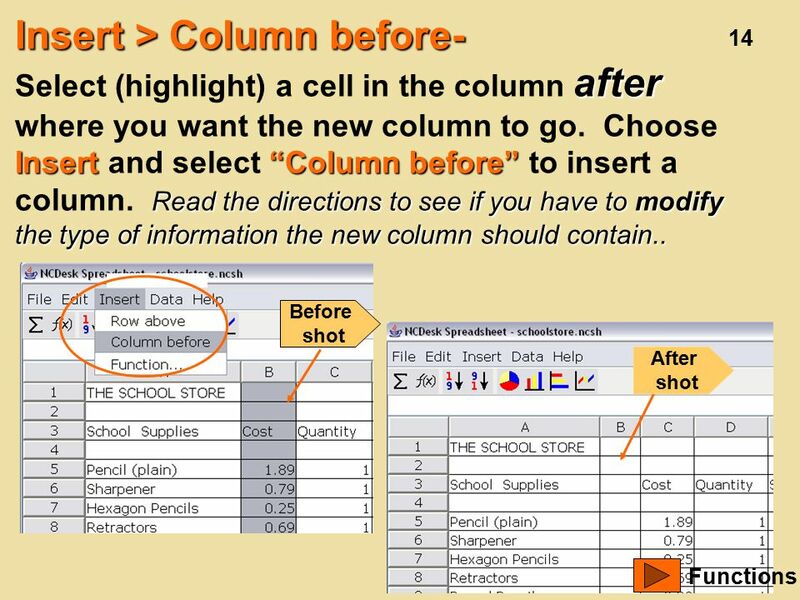  Exploring Spreadsheets  Basic Editing Functions  Using Formulas  Vocabulary. 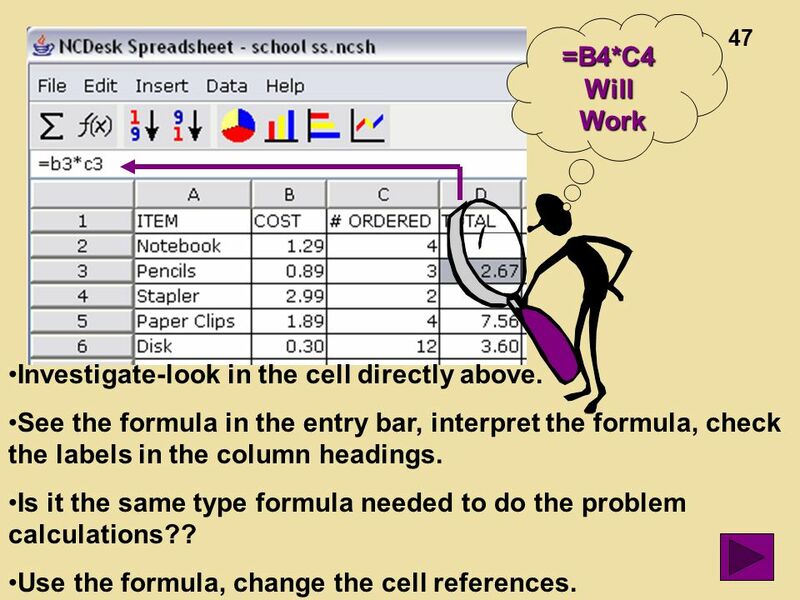 Spreadsheets Ms. Scales. 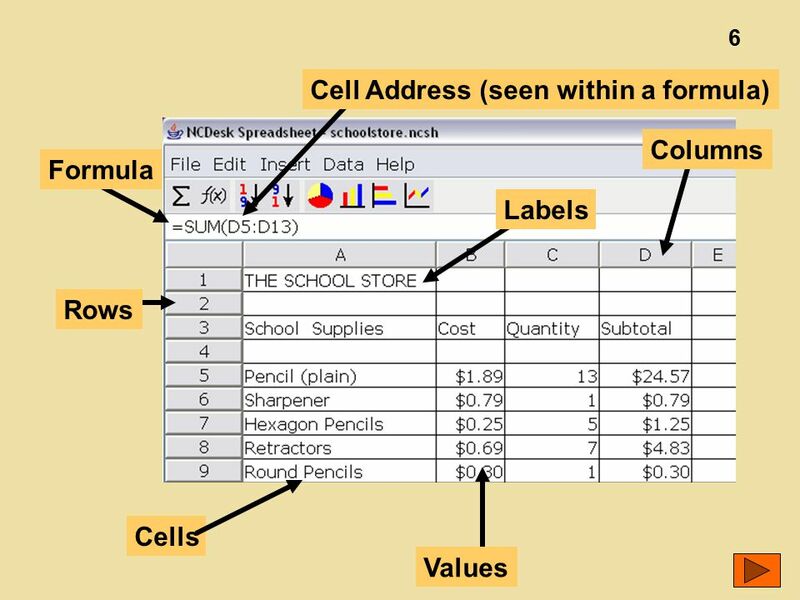 What is a Spreadsheet? 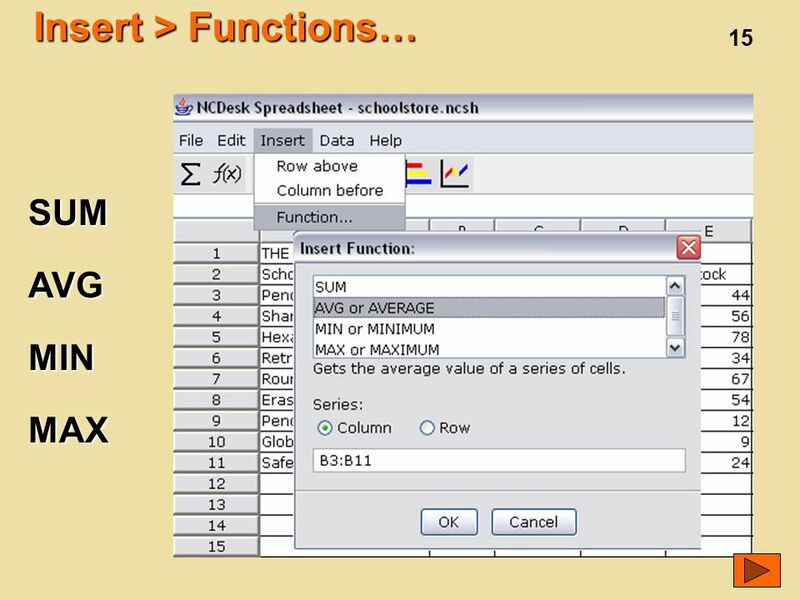 0 Spreadsheets 0 A document, or table that is made up of rows and columns. 0 Table 0 Columns and rows. 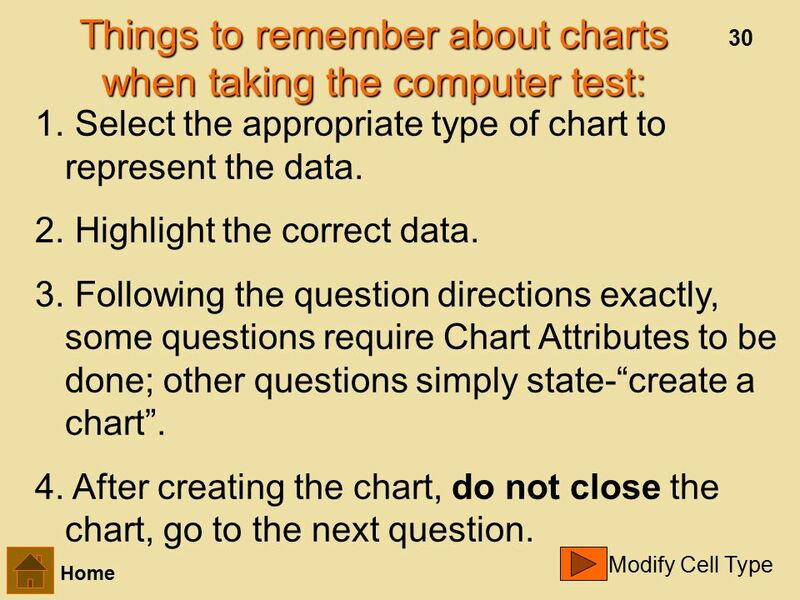 Microsoft Excel Computers Week 4. 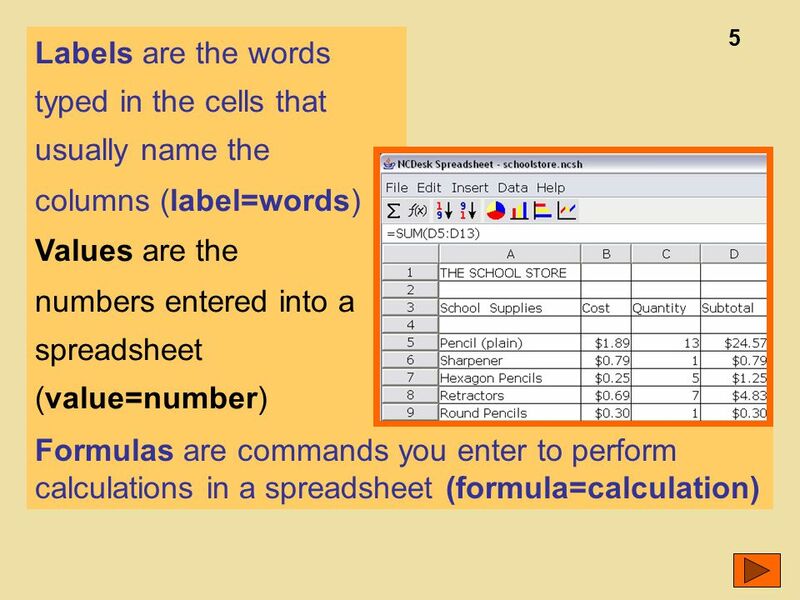 3-dimensional formula A formula that refers to cells in other worksheets. 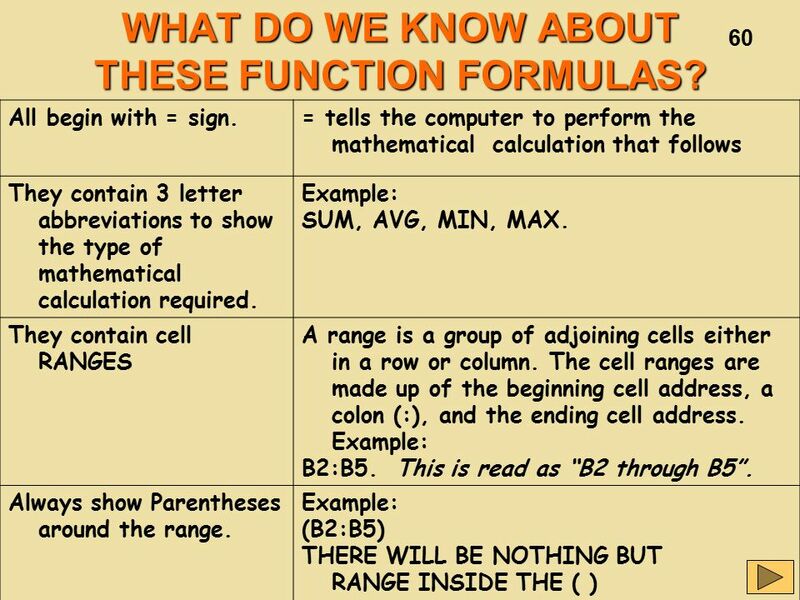 Using Complex Formulas, Functions, and Tables. Objectives Navigate a workbookNavigate a workbook Enter labels and valuesEnter labels and values Change. 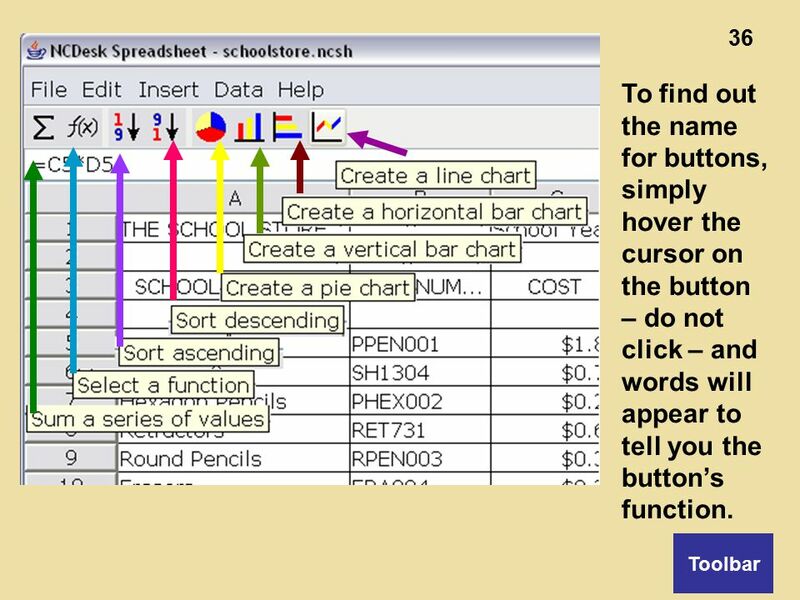 Excel Tutorial Enfield High School 2007.